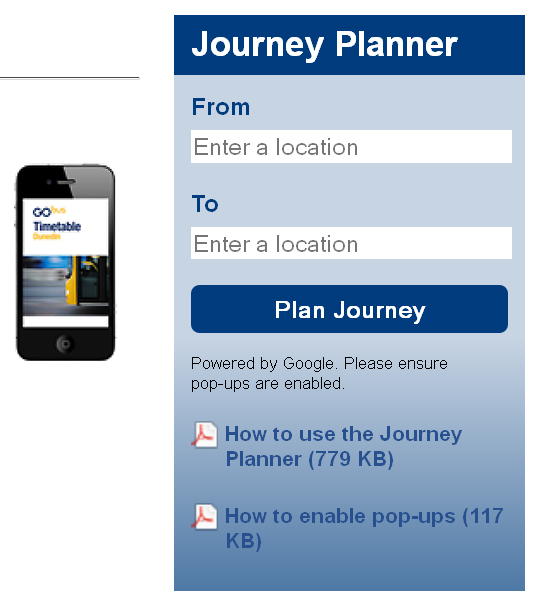 Bus users can now find the best route to travel using a new internet-based journey planner. The planner is available on the Otago Regional Council’s website and uses Google transit information. Council corporate services director Wayne Scott said the planner was introduced to make the council’s bus timetable more accessible. Users of the journey planner enter a bus journey starting point and destination. An outline of key elements of the draft Otago regional public transport plan. Dunedin’s bus service is set for sweeping changes that may lead to faster and more direct routes away from smaller residential streets. The draft Otago regional public transport plan includes a central-city hub for a system set to cost more than $100 million in the next decade. A $100m bus hub, and DCC has ideas of taking on management of city buses. Is ORC paying for the hub, regardless? Looking at the ORC map of proposed ‘major routes’ we see that most residents in the city (be they carless, cycle-less, disabled, flat-bound or hill-bound) will continue to have poor access to a convenient bus service. So that is that because ORC refuses to introduce frequent shuttle services (due to the central government funding regime for public transport). What does nothing mean for the have-nots who can’t all live next door to supermarkets, schools, workplace and medical services. Oh right, the thought never occurs. OPINION On the face of it, proposed comprehensive changes to Dunedin’s bus services have merit. The changes make up the bulk of those proposed in the $100 million 10-year Draft Otago Regional Public Transport Plan,* developed by the Otago Regional Council in collaboration with the Dunedin City Council, the New Zealand Transport Agency, the Queenstown Lakes District Council and bus companies. […] They aim to address some of the challenges facing the network, including low patronage, complexity, a low integration with other transport, cost, energy efficiency, the diverse demands of users, and Government funding constraints. The proposed changes are major. *See proposed route/frequency maps for Dunedin on pages 41-44. Given the (subsidised) cost per bus passenger, wouldn’t it be a good idea to look at something different? The bus guy who has annoyed the taxis did that. Airport shuttles work, they take people from (or to) all parts of town, right to the door. Given that most bus users don’t get where they want to go without trudging and waiting, a shuttle-type service that could pick up people along the way, drop them at designated pickup places if they want to go in a totally different direction to the majority of the other passengers. E.g. person from Corstorphine wants to go to Andersons Bay but most are heading to city centre > hospital, University > N E Valley. So they get down the hill and onto a convenient through route to Andersons Bay without all the other passengers having to do a big detour. There must be better ways to achieve people-moving for the same or lower cost, and more convenience for the people who need to get from place to place. Subsidising flexible passenger-carriers – bus, van or car – looks better to me than what’s suggested so far. Don’t be daft Hype. What about the bureaucrats? Do you want to see them all unemployed? WINZ can assist them to retrain, getting passenger licences so as to join the fleet of varied transporters. Cycle lane pushers would, of course, give people doubles on their bikes. Remember Calvin, this is the 21st century, people are expected to have several changes often involving retraining, there’s no more “job for life” entitlement. Not for the common working man & woman, anyway. Then there’s the smartphone apps for door to door transit by the most available vehicle (be it bus, shuttle, car, taxi) – I think we discussed these two or so years ago as a perfect scenario for Dunedin’s geography. Certainly, a google now shows greater use of these applications worldwide. Apologies for not contributing to these pages for a while! From initial readings of what the ODT editorial says about the ORC Regional Public Transportation Plan (this morning) and from what the ODT reports have said so far, it seems to me a lot of ‘missed opportunities’ have already occurred in the draft plan – some very obvious! I’ve only read the first page and that gives away a lot already – all the agencies consulted and no input from any ‘transport users groups’. With respect, none of them know what the customer actually wants. Public input – which they stress they require – will as usual be almost completely ignored as the results from public input will involve either NZTA having to change the way they go about funding public transport or the ORC (or DCC if they ever get round to taking over the running of the buses) having to fund a service that people are going to actually use. I shall have a good read over the next week or so and submit to the ORC my views on the matter. If, as a result of reading the editorial and other bits in the ODT about the Draft Plan have anything to do with it, the proposal as it stands will be an unmitigated disaster for Dunedin – and that says a lot given the current ‘farcical’ public transport system on offer! Phil Cole – nice to see you back! Hmmm, no bus user consultation behind the latest maps, that’s sick. Will keep monitor on this and write a submission. None of them know what the customer actually wants, Phil? But think how annoying it would be to have all those untrained types and their “input” messing up pisselegant Professional Plans. Public Transport is, always has been, and always will be a “Lemon” no matter who does what. It would be really interesting if they simply stopped it altogether for a period and studied the impact. Perhaps then they might have some better ideas. Ever since the motor car became affordable to own and run for the masses, public transport has been on the back foot. Remember the “emergency”, the bus drivers’ strike? I think it was back in the dark years of Muldoon’s rule. Special dispensation was given by Beehive decree, that people with cars could pick up passengers. Regular bus users were advised to wait at bus stops so it would be obvious they needed a lift. Cuba (IIRC) has a cool rule. You gotta car, you got a duty to pick up people who only got feet. Radical changes to the Dunedin public bus system have been approved for public consultation. Otago Regional Councillors have voted to further explore a draft proposal for the new system. And councillors are keen to hear what residents think. With smartphones now cheap as chips, if you don’t want the latest fastest gadgetiest model with Added Vitamins, the last century bus system is rapidly moving onto the endangered list in places that don’t have the geography and population density to keep it in tip-top condition. Cr Michael Deaker praised the work that went into the plan, but raised concerns a policy to get the bus service ”as close to people as possible” was being replaced with a ”patronage” approach. Proposed sweeping changes to Dunedin’s bus service are headed for public consultation. But an Otago Regional Council meeting yesterday heard concerns about a need for people to walk further to bus stops in a hilly city with a cold climate. Councillors also noted public calls for routes closer to their homes, reflected in previous council policy, did not result in greater use of the system. Pak’n Save South Dunedin: Tuesday, July 29, 11am-2pm. The death warrant has been signed for Wellington’s trolley buses. […] In 2017, the 60 trolley buses that have carried Wellingtonians around the city for the past 90 years will be replaced with hybrid diesel-electric buses. The capital’s other 218 diesel buses will suffer the same fate but will be progressively phased out as they reach their end of their useful lives between 2017 and 2032. The Caversham Highway project is slowly taking shape, and has reached a point in which public bus services have to be adapted to the new road. Smaller buses may be a part of Dunedin’s revamped public transport system, as the Otago Regional Council looks for flexibility in the network. ORC support services manager Gerard Collings said yesterday as new contracts were awarded, the council would try to ”optimise” bus sizes. The ORC will next month begin consultation on the service, following a draft Otago regional public transport plan that includes faster and more direct routes. A new columnish sort of thing from ODT’s recently re-acquired reporter David Loughrey (aka Charles)! The travellers were reserved, quiet, decent, sensibly dressed, and at no time encroached on each other’s personal space. In the first of a series focusing on Dunedin and its people, ODT reporter David Loughrey casts his quizzical – some would say quirky – eye over a public transport system about to be left blinking in the harsh light of public scrutiny. On an epic, but remarkably efficient, voyage from the suburbs to the city he found the spirit of Dunedin in the darkened streets of Mornington. UBER, come hither please… Recently I paid $9.50 to travel from Centre City New World to lower Pitt Street with the weekly groceries, using City United Taxis. The smartphone app causing a stir around the world won’t spark protest action in New Zealand, despite it fostering illegal competition against cabbies, a taxi spokesman tells ODT. New Zealand Taxi Federation executive director Roger Healey says no protest action is planned in New Zealand despite Uber running illegally in Auckland since May. The growing use of the Uber app recently sparked protests from registered cabbies in Washington, London, Paris, Berlin and Spain. The San Francisco-based company’s mobile app connects passengers with available drivers. The payment for the ride was settled with Uber, not the driver, with the passenger’s credit card being billed after the ride. Does providing a subsidy to students lessen cost demands on ratepayers for running bus services, or is ORC merely sampling inequality at Dunedin. University of Otago and Otago Polytechnic students have heralded a recent decision to continue a bus discount initiative they say is a small saving that makes a big difference. [NOTE !!!] The trial was approved by the Otago Regional Council despite no comparable figures showing more students had used the service during the trial. A review of taxi regulations has been launched following a complaint from new industry player Uber. The company – which allows people to order rides on their smartphones, as an alternative to a taxi – has complained of police booting passengers out of cars, because they have been operating without licensed meters. The police action followed complaints from other taxi companies. [Associate Transport Minister] Craig Foss announced this afternoon he had asked officials to review the regulatory framework for small passenger services, such as taxis and private-hire cars. The Otago Regional Council is seeking feedback on how it manages public transport within Dunedin over the next few years. Uh oh, cold feet and city council debt CRISIS cutting in – pity Sarah Connolly and her department are somehow still transfixed by shunting the multimillion-dollar cycle network through with political assault by our couple Daaave/Minty and Katie-Did’s sledge hammer. Spot the losers who can’t read a balance sheet, especially not if when the three big banks let loose a call on capital the council hasn’t got, with claim on the ‘roofs over our heads’. Changes to some of Dunedin’s public bus services will cost an extra $300,000 a year. The current service programme has to be adapted to fit in with new legislation being implemented by the government. And it means the Otago Regional Council will foot half the bill. Daaave’s brainwave (see last sentences of the article) and Jinters’ logic misses out all mention of the drain that would occur for DCC ratepayers and residents over time. These two have no learning about finance or of consequences – they haven’t yet discovered why ORC’s in a better position to fund public transport ALTOGETHER. Doh. It seems the Dunedin City Council is getting cold feet about being responsible for public transport. The council initially looked at taking over operation of the city’s public transport system from July next year. But now it’s in favour of delaying that start date, until at least 2017. Considerable change is proposed for Dunedin’s public transport system, and there’s a lot for residents to get their heads around. Thu, 31 Jul 2014 at 10:22 p.m. Message: A kindly edited version of my letter appeared in the ODT today. In case anyone is interested, I had optimistically added the attached photo. After many years of the ORC being panned for their awful Dunedin bus service, the NZTA now says it prefers to keep with the ORC rather than transfer the operation to the “relative naiveté” of the DCC. This despite last year’s NZTA dust up with the ORC for refusing to accept standard NZTA bus contracts putting $1.5 million of NZTA funding at risk. Looking at last week’s DCC submission to the ORC Transport Plan, ‘relative naiveté’, seems kind. The DCC submission recommends that the ORC: “help the case for suburban rail in the future”, consider “the possibility that the DCC may make George St and the Lower Octagon more of a pedestrian priority area”, include policies “with a greater diversity of fuels and alternative energy technologies”, remove reference to “the city’s slow population growth”, and amend the ORC statement “that public transport services will always be slower than private motor vehicles” in favour of “ensure public transport travel times are competitive with private motor vehicle travel times”. When I complained that it was absurd to suggest that a bus could be as quick for me as my car, Councillors quickly countered “only if you can find a park”! An alternative energy pedal-powered bus is pictured, in case electric busses prove to be insanely unaffordable. Lee, you need more crystals. Somewhere over the rainbow dreams come true. Homeopathy heals skepticism, all you have to do is believe. You have an angel watching over you, you are not alone. There’s Hilary hardedged and grown up among the fluffy bunnies and lapdogs. Can’t you two get together for an organic smoothie, and swap crystals for the day? Cars can be slower than buses. This one was: http://www.odt.co.nz/news/dunedin/311063/theft-leaves-caregiver-clients-lurch. The blither that is today’s DCC, thanks Lee. What a confidence boost in our local authority, on the bones of its arse. A proposal to change the route and frequency of a bus service to Brockville has led to about 200 submissions being made to a proposed transport plan. About 330 people and organisations have made submissions to the draft regional public transport plan that contains sweeping changes, expected to lead to faster and more direct routes away from smaller residential streets. A panel of regional councillors, Sam Neill (chairman) and Michael Deaker, along with Dunedin city councillor Aaron Hawkins, will hear the views of about 40 of those submitters at a hearing starting today. A hearings panel considering the future of Dunedin’s bus service gave a clear message yesterday controversial changes to the Brockville route will be reconsidered. The panel will reconvene on Thursday for a second day of hearings. Where will the bus ‘hub(s)’ be located? ORC support services manager Gerard Collings said after the hearing the ORC was discussing sites with the city council, the NZTA and bus operators. The site for the proposed Dunedin bus hub may become clearer in the next two months after a panel considering the future of the city’s public transport system heard a central, accessible location was ”critical”. Representatives from Go Bus, a company contracted to the Otago Regional Council to provide services in Dunedin, told the panel a new network would rely ”heavily” on good interchange infrastructure, which needed to be accessible, with good security, shelter and waiting areas. A busy block of Great King St has been identified as the preferred location for Dunedin’s planned central bus hub. The Otago Regional Council, which unveiled plans for the hub last year as part of a bus system overhaul, has identified Great King St between Moray Pl and St Andrew St as the preferred location for an on-street hub. Council support services manager Gerard Collings said preliminary plans suggested the central hub would replace some car parks along Great King St. Older church-going Dunedin residents are being disadvantaged by a lack of buses on Sunday nights, and a direct bus service is also needed to Forsyth Barr Stadium, Grey Power Otago says. The organisation’s president, Jo Millar, was making a submission yesterday to a combined hearing panel, which includes members of the regional transport committees of the Otago Regional Council and Environment Southland. Bus advocacy group Bus Go Dunedin supports a proposed central bus hub but wants to ensure it is well-designed and welcoming for users and does not become a poorly-maintained “ghetto”. That comment was made yesterday by Bus Go Dunedin secretary Alex King in a submission on draft Otago Southland Regional Land Transport Plans. Giving top priority to proposed Dunedin cycle safety initiatives is a “fantastic step forward” Spokes Dunedin chairman Robert Thompson said yesterday. Spokes Dunedin is a volunteer group which advocates on behalf of Dunedin cyclists. And Mr Thompson was commenting in a submission to a Dunedin hearing panel, that includes members of the transport planning committees of the Otago Regional Council and Environment Southland. Bus Hub: One likely location for the hub is Great King St and construction is expected to begin about 2018. Moves to create a Dunedin central-city bus hub are part of wider public transport improvements costing more than $4 million that will include developing ”super stops” at the University of Otago, Cargill’s Corner and Green Island. These proposed ”super stops” are likely to offer not only bus shelters but also toilets, as well as ”real-time” electronic displays, updating when individual buses are due to arrive, Otago Regional Council transport draft plans indicate. I suppose they must continue to try to improve the system of public transport and I expect that what ever they suggest will meet with criticism but looking at the plan I believe that it will cost a lot with very little increased patronage. The central city ‘hub’ if located in Great King Street does not look good to me to start with. The ORC spokesman observes “an “extremely complex” bus route network, meandering routes resulting in slow travel.” Yet they seem to propose to have the buses ‘meander’ through the city centre to get to a ‘bus hub’ that has toilets and very good electronic time tables. I’m sure that will be great for olds when caught short but I don’t see that it will result in more passengers or reduce traffic congestion; rather the opposite. The reasons for DCC contribution of $500,000 to enhance bus hub, providing central facilities for walking, cycling, taxis and inter-city buses seem absurd but at least it is modest. The DCC spokesman saying “help[ing] reduce traffic congestion, improving people’s health and adding to Dunedin’s attractiveness” is ingenuous. I don’t see how the revised system will do anything that he says. But I note that the bulk of the funding of $3,363,518 is from the NZ Transport agency. We all know its ‘mantra’. However it seems likely that the real reason for all this is the extra $3,474,309, to be spent on procuring and implementing an “improved integrated ticketing system” for publicly-contracted bus services. Wouldn’t it be better to leave the whole shebang to the private bus companies to run? Then you just might get a service tailored to the need and demand. This is one of those services that is more than a business. Private operators axe unprofitable routes, i.e. the long ones, particularly the farthest away ones because the further it is from “town” the fewer customers per block. Result, leaving people with the longest journey (least affordable by taxi, most impractical by bike (esp with children, groceries) or bike) with no way of getting around unless they have a car. I like the toilets in the hub plan. Easy to find – ask anyone, they’ll probably know where the nearest bus hub is. There’s nothing pleasant about being in a town, busting to go. Not even a shrub to hide behind! Anyway the fewer piddles and poops in doorways that shopkeepers have to clean up in the morning, the better. I’ve always liked the idea of closing George St through to the Octagon to traffic: Great King, Filleul and most of Moray Place become a 1-way loop (getting rid of most of the traffic lights, replacing them with triangular traffic islands) and the portion of Moray Place between Great King and Filleul becoming a 2-way bus-only ‘hub’. Mike well that would be nice – but I have to ask what traffic? There is SFA traffic in Dunedin most of the time – a couple of ‘blips’ at about 8 a.m. and 5 p.m. and then – SFA again. And the busses are easy to find at any time. They are those big things that run up and down George street – empty. But I suppose we need to spend our money on something. Extra toilets – well I suppose we do have a lot of incontinent people about so yup let’s as [have] a few of these. Toilets are always a ‘big’ issue for Dunedinites. Cr John Bezett when councillor for the South Dunedin ward pushed for a dunny there and took away Carisbrook to further the interests of his ward. The Anglicans want one near the church even though there is a dunny near the library that could be redesigned for 24/7 poos and wees. You could have dunnies as common as dustbins, but people are intolerant of Bogan Cultural practice that makes public urination and defecation a human right. Young men in particular like to mark their territory and the act of public urination is a mark of initiation into manhood. Lastly it is not men’s fault that they are more superior in their biological evolvement where this is more easily accessible at the touch of a fly. Women clearly can’t do everything. You can’t argue with that! – but take care with the last bit! – Elizabeth is watching! Oops Sorry should have said have instead of as. Not to worry though – the whole subject has moved on to shithouses inhabiting the Edinburgh room – much more interesting! Mick, don’t let us forget the Council Chamber directly across the Stair Hall, same Level. God – they are everywhere. Upstairs, downstairs and in your worship’s chamber. And BTW Calvin – everyone is an expert on s***houses so your chances of getting this back to the topic of bus transport is getting remote, I’m afraid. I like the notion of a busy bustling shopping centre but you’ve got to have enough people to populate it and do the bustling, otherwise it’s several blocks with one man and a dog, like Oturehua on a slow day, except he’s not allowed to bring his dog into Dunedin’s CBD. Already there are big-box centres complete with cafe, garden centre, an area for the tinies to play while you shop, and lots of free parking. The habit of going to those for necessities – paint, hardware, garden supplies – is already established. Will people abandon those to go and bustle around the CBD shops, stressing all the while that if they stray past their original destination shop and don’t get back to the expensive parking meter they will get hit even more with a parking fine. Cyclists and people who travel by bus may use the CBD, though even cyclists can as easily go to the big boxes, and have to for many necessities. The CBD has been shattered like Humpty Dumpty, and I don’t see anything happening that will “put it together again”. Rates are high for commercial buildings that aren’t the right size or shape now, rents are too high – perhaps the rates contribute to that? It’s boring walking through town past dead shop windows. Mike, all good except that the DCC will not REDUCE the number of traffic lights whatever the reason. The DCC traffic light department would have to start putting them up trees or down manholes or have to —- disband. Toilets don’t just have to be “there” – they have to be clearly visible. Locals have some advantage, though not necessarily in a part of the city with which they are not familiar. Visitors from outside Dunedin, whether NZers or from overseas, can’t be expected to guess that if you go down this alley there’s a toilet but it’s closed, just hang on till tomorrow morning…. Pregnant women, men with so-so prostates, small children, all sorts of people of all ages can need a toilet even if they “went before they went out”. There are few things that take the enjoyment of all other experiences like the unsatisfied need to find a place to “go”. Travellers’ tales nearly always include toilet stories, some of them very funny for those of us who weren’t there, they do a lot to compensate for not having the money and leisure for travelling to exotic places. On the other hand, supply of clean accessible toilets leave people in a good relaxed frame of mind to enjoy all that’s delightful – and then tell all their friends and facebook “friends” what a great time they had. Public toilets are a wise investment, for ratepayers’ personal needs and for enhancing the reputation of Dunedin. Sure, nobody writes a blog post about adequate loos, on the other hand they do write about the interesting things they saw and did instead of writing a moan about dirty toilets or not being able to find one at all. As always you make good points – but (can’t resist this) don’t get bogged down on this. The ORC is supposed to be running buses. We are talking about the DCC and ORC working together – Yeah right – DCC runs bogs and transportation planning and the ORC runs the buses. Already looking at $200m to sort this. For god sake don’t tell Calvin. I once put forward a proposal for an alternative transport system to the Regional Council which went nowhere. At the risk of boring everyone this is essentially it. That first the buses ought to be tailored to the citizens obvious requirements. By this I meant about half the size of the present behemoths. That would allow more flexibility in traffic. Next, that they should be removed from the George/Princes Sts central business area. I proposed two terminals, one at Transport Place as at present, the other at the George St, Regent Rd intersection. This could incorporate the now defunct BP site. All northern services including Wakari, Roslyn, Maori Hiil, Normanby, Opoho, Port Chalmers services to the northern terminal. All southern services including Mosgiel, St Clair, Andersons Bay, Peninsula, Corstophine, Mornington to the Transport Place Terminal. Between the two terminals along the George St Princes St axis a shuttle service by a number of “noddy train” type units constantly running back and forth on a ‘hop on hop off’ demand free service. The cost of this factored into the ticket into or out of the terminals to outer destinations. That would remove the inner city chaos of big fume belching buses. Leave it a more friendly environment but still connected to the main services. Needless to say this was ignored by the ORC and its transport boffins. Worth a revisit? Who knows? Certainly for the DCC to take over the existing mess would be a ratepayers’ disaster. Calvin, I like it! Even as a car user, I like the idea of not having to either waste time trudging from one end the CBD to the next place I need to go to down the other end. I’m buggered if I’ll pay 2 bus fares on top of longer parking cost, when the marginal cost of using my car to drive down there is minuscule. Hype, you like it! But by the amount of comment you are the only one. Toilets seem more important. Sorry, Calvin – a fan, I read your submission and accepted it as a good idea back then, you’ve also raised it elsewhere at What if? !! Toilets. Others call them shithouses. I think we have enough of them in the town hall already. No need for anymore. Access times are limited – most of us wanted DCC to open them 24/7 for 365 – they won’t do it…. Of course there is the cost of 24/7 and would it make much difference to drunk and/or stoned patrons who frequent bars in the early hours? Not all the people who need a toilet are drunk or stoned. Not all drunk or stoned people are so uncouth or brain-f*cked that they wouldn’t use a proper loo if they could find one. Not all the people who frequent bars till late are even very drunk, some are just totally into the music and atmosphere and being with friends. And there are various reasons for being in town in the early hours, such as just having arrived after driving from somewhere else, or coming home from visiting someone. What’s the most likely time for a person to poo or pee in a doorway? Daytime, or night when there’s hardly anyone around and they are hidden by darkness? By that reasoning the best time to close them would be 8am-6pm !!! I was specifically referring to the Edinburgh Room. I start talking about alternatives for the transport system and all we get is toilets and where to do it. Oh well, I suppose it is all a question of priorities. To change the subject slightly. You would have noticed in today’s ODT, Mr Feather complaining to the ORC about traffic problems with the Gordon Rd / Quarry Rd, intersection out in Mosgiel. It would appear that Mr Feather and his mate on the board can be held to account for a lot of the problems that are accruing at this intersection. Residential land was being opened up on the hills above Gladstone Road, and at the time of the resource consent it was suggested that the development could come out on to Quarry Rd, through Woodland Drive, and this would take a lot of pressure of the intersection that Mr Feather is now complaining about; but Mr Feather’s appointed crony on the hearing committee at the time put a stop to that idea. All the traffic from this new development now has to travel through the intersection that Mr Feather is now complaining about. It is apparent in the community the dissatisfaction with the Mosgiel-Taieri Community Board. Many in Mosgiel who have come up with suggestions for various problems around Mosgiel; but without any thought or consultation with the community, the community board appear to veto any suggestions that don’t fit their personal agenda. Some drivers are facing “grave difficulties” in using a major Mosgiel intersection at peak times, a community representative, Bill Feather, warns. Mr Feather, who chairs the Mosgiel-Taieri Community Board, made a submission this week about safety issues involving Gordon Rd, Mosgiel, at a Dunedin hearing involving the draft Otago Southland regional land transport plans. He highlighted traffic problems involving the intersections at the first set of traffic lights in Gordon Rd, including the intersection of Quarry Rd, Gordon Rd and Gladstone Rd North and Gladstone Rd South. Received Fri, 20 Mar 2015 at 12:55 p.m. It is a wee bit strange lass, that billy boy thinks there is too much traffic at the Quarry / Gordon Road intersection, and at the same time he is backing a new pool with a catchment of 30,000 with the majority having to use this intersection to get to the pool. Just what is his game, and whose rules is he playing to ? Maybe he could get free visits to this new medical centre ? The contract provides for services for Mosgiel, Fairfield, Green Island, Brighton and Abbotsford. In a ”very positive start” to planned major Dunedin public transport improvements, at least six new 42-seat buses will be running on Dunedin’s southern bus routes from July 1 next year. Otago Regional Council members yesterday welcomed the letting of the first big route contract – which has been gained by the current provider, Go Bus Transport Ltd – under the ORC’s new regional passenger transport plan. The Otago Regional Council has invited four firms to take part in a competition to provide a design for the proposed new central Dunedin bus hub, in Great King St. The preferred location for the hub is near the central police station. The Great King St location for a bus hub suits me. But I don’t know how this ‘preferred site’ decision was arrived at. A decision by Ritchies Coachlines Ltd to buy two new buses, valued at more than $1 million, for Dunedin routes is a vote of confidence in public transport’s future in the city. That comment was made this week by Ritchies regional manager Malcolm Budd. █ New low-floor, low-emission Scania buses will run on the Concord to University of Otago route. After hearing from a Christchurch colleague this week that the new bus hub at Christchurch requires some buses to reverse out of the hub…. what hope the bloody ORC creating a congested INCONVENIENT hub near Farmers in Great King St. The Otago Regional Council is making major changes to the city’s bus system with fare increases and new routes. A free zone transfer scheme is also being rolled out to alleviate some of the cost to bus users. But there’s concern that the changes may negatively impact those with mobility issues. Well, ORC did consult – about a year ago, I think, in their Regional Passenger Transport Plan. But I don’t think they responded much to submissions. When I commented that I didn’t think they would be able to get a bus up and down Shetland St (as proposed) even in good weather and doubted that two could pass, they just said they would ask the DCC roading people for advice on that. Which made me wonder why they hadn’t done that first! In fact, I wonder whether their submission process was cynical – because they had everything all worked out and didn’t want to change it on account of submissions. It is a great deal of work to plan it all. They said they were now looking at the whole network as a complete system instead of a conglomeration of many complicated and changing routes which has just grown piecemeal and bigger over time. Yes, I completely agree this was the right way to go – to optimize the use of resources over the whole system and simplify routes to help alleviate the incomprehensibility of the timetable. However, conceptualizing a system results in a model. Famous saying about models – all are wrong and some are useful. Figuring out which are useful and how and when is the tricky part. I think of a plan as something you have to depart from when necessary. In some specific cases, the model on which ORC are now basing the whole system and its conceptual priorities just will not work. And it will be the users who will actually experience that. Can ORC be flexible? Most people do not make submissions to plans. The ORC must know that because the numbers of submitters on their plans has generally been extremely low. I don’t believe they ever advertised the proposed route changes on buses where passengers could see them. I expect most of the long-planned-for changes will be a great surprise – and sometimes a nasty shock – for most users. I agree with Paul Allen that insufficient consultation (ie fair minded comprehensive consultation) occurred – and we know for certain ORC’s track record on not consulting the bus users of St Clair Park, Corstorphine, Kew etc… which has meant families walking from their homes to Dunedin Hospital and home again up that sainted hill…. people not being able to get to their health providers in South Dunedin…. It appears desktop scenarios have been pushed by ORC without customer checks and controls on startling instances of randomisation by dickhead bureaucrats. I was in favour of a central city bus hub BUT ONLY if it was associated with a frequent free central city shuttle service passing through the hub and going in both directions. This would provide greater choice and comfort for users, maybe encouraging ‘park and ride’ and also relieve bus congestion in George St. As things stand, there’s a worrying possibility that the proposed Great King St bus hub will have a “Build it and they won’t come” outcome. The Otago Regional Council has released more information around its plans to streamline the Dunedin bus network. It comes a couple of weeks after a group of residents expressed their concerns about a lack of consultation on the changes. From August the 15th a new five-zone fare structure will replace the current seven-zone structure. Council manager of support services Gerard Collings says it’ll reduce the number of fare change points, making it easier for users to see how much their travel will cost. The new fare zones are part of a series of changes adopted in the Otago Regional Council’s latest public transport plan. Go Card users will generally benefit from changes to Dunedin’s bus network system, which include a switch to a simplified five-zone fare structure next month, Otago Regional Council support services manager Gerard Collings said yesterday. The new structure, including the Dunedin-Palmerston bus service, will replace the current seven-zone system on August 15. And the number of fare change points will be reduced, making it easier for bus users to immediately see how much it will cost to travel to their destination. A Dunedin bus users group, Bus Go, plans to provide up to a dozen “bus buddies” to help city bus users cope with changes to public bus routes and the zone system next month. The Otago Regional Council is undertaking a campaign, including media advertising, to raise public awareness of the changes. The council has a graphic on its internet site highlighting the zone changes, which will result in seven zones being reduced to five. There is the crippling plan to remove direct bus services out of George and Princes Sts via some stupid tight and unworkable bus hub beside the Farmers store in Great King St, hampering car traffic on that street and destroying shopper access to Farmers via their carpark as well as public access to the Central Police Station – thus taking business away from struggling retailers on the main streets. ORC says it will run shuttles along the main street but that’s two buses not one for passengers coming and going to the suburbs. All we ever wanted was FREQUENT SHUTTLE BUSES WITH DISABLED AND WHEELCHAIR ACCESS all over Dunedin… like they have in Vancouver. We pushed that idea years ago but the idiots at NZ Govt, NZTA and ORC keep denying the bleeding obvious. Well, Uber may shift them along in their “envisioning” by leaving them all Far behind in the market. Uber tech can be adopted by private cars, shuttles, taxis and other forms of public transport. A move to ”quite viciously slash” the Belleknowes off-peak bus service breached the letter and spirit of the Otago Regional Public Transport Plan. That comment was made yesterday by Dunedin bus users support group co-president Peter Dowden at an Otago Regional Council public forum. Some of the biggest changes in Dunedin’s bus network system for more than 20 years, including changes in at least six weekday bus routes and a simplification of fare zones take place on Monday. 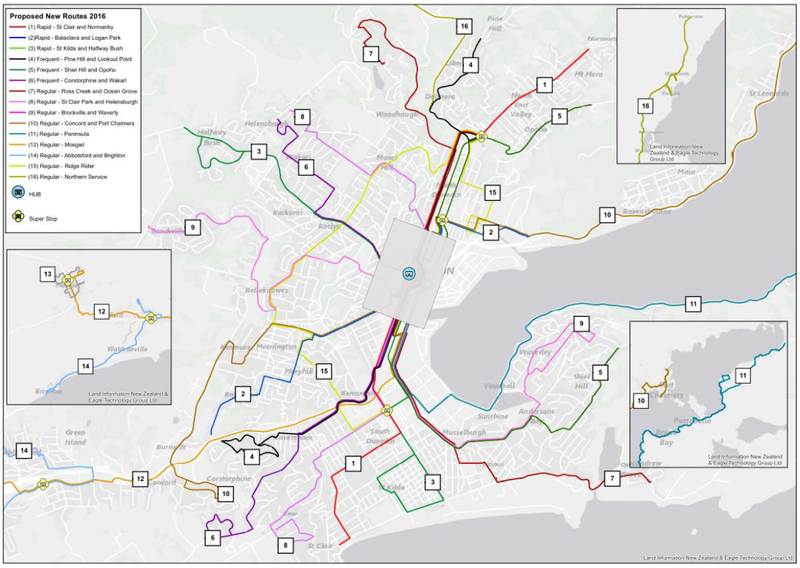 […] Bus Go Dunedin bus users group co-president Alex King [said] the many bus route and zone changes that will take effect on Monday were “very positive steps” and would help, over time, make Dunedin a more attractive, vibrant and liveable city. Five volunteer “bus buddies” pitched in to help more than 200 members of the public adapt to big changes in the Dunedin bus system which took effect yesterday. It was the first day of a new system affecting several routes, with buses switching to simplified, more direct routes intended to make bus travel faster and more attractive. The current daytime route changes mean about 40% of the city’s overall public bus services have switched to faster routes. The remaining 60% of changes are due to take place early next year. Bus zones yesterday also shrank from seven to five, and the names “City” and surrounding “Ring” replace the former zone one and zones two to four, respectively. It may be a case of more is less when it comes to some of the new route signs on Dunedin buses. […] The focus was previously on providing the bus destination in one or two words, and the route number. But some bus users say that some of the new signs are confusing, partly because the point of origin is included as well as the destination, resulting in the overall wording being too small and complex to be easily read. […] Co-president of bus user group Bus Go Alex King said the signage problems were ”disappointing” and he acknowledged some sign lettering was smaller than the 125mm height that was an NZ Transport Agency requirement. If they put the > direction sign in front or behind the place names, e.g. It would be quicker to decode than words and prevent one name appearing as an orphan without hint as to whether it’s to or fro. Ritchies has switched to big, simpler signs to end problems with cluttered, hard-to-read messages on the front of buses. […] The ORC had received some “both positive and negative feedback” overall and would learn from this, including when the remaining 60% of bus route changes were implemented early next year. █ Bus Go will discuss bus issues at a public meeting in the McNab Room at the Dunedin City Library at 11am on Monday.